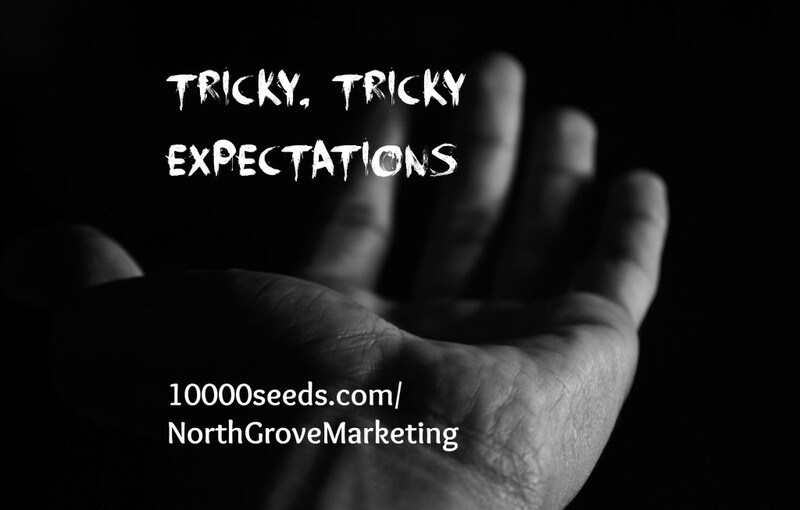 The subject of upline expectations came up during a recent mastermind call with our team and since I have so many thoughts about expectations, shoulds, coulds, pushing and feeling pushed, I figured a blog post might be in order. These are my own thoughts from my own experience, and you may resonate or disagree. Start a conversation in the comments section below, because this is a hot-button issue for many and your own thoughts might help clarify something for someone. Almost all humans have varying degrees of expectations about others: in love relationships, family relationships, work/business relationships, even relationships we form with baristas at the local coffee shop for 90 seconds or less. Expectations are normal and healthy and necessary. When we want or need something from someone else, that gives us an opportunity to explore and define boundaries. Then, we get the opportunity to tell others our boundaries and negotiate with them if necessary to get everyone’s needs met in the fairest way possible. Notice that I said “fair” and not “equal”. I’ll get back to that in a moment. When you FEEL someone has an expectation of you, explore that feeling. Are you assuming? Are you guessing? Are you extrapolating? Are you coming up against blocks within yourself that you might want to explore further? When you can separate your own feelings from what you guess another person might be feeling, then you can more clearly see what to do. When you KNOW someone has an expectation (as in, she has clearly communicated what she wants/needs you to do), explore that knowing. Are you totally against it, and why? Are you hesitant, and why? Are you enthusiastic, and why? When you honor and acknowledge your feelings about being asked to do something, you can more clearly see what actions are fair for both of you. Most of us (both women and men, I’ve noticed) give a knee-jerk reaction when asked to do something. We say “yes” immediately, without taking five seconds to check in with ourselves to feel how we’re feeling. When there are multiple expectations spread out over the course of a relationship, the “yes” reaction becomes the expected reaction (pun intended), and sometimes it’s hard to slam on the brakes and set correct boundaries. When you say “yes” to someone and don’t do what’s asked, that violates trust. Enough trust violations and the relationship can come to a complete end. When you say “yes, but” to someone, that opens a space of conversation and negotiation and you give yourself the opportunity to say what you feel and define what you’re actually able/willing to do, and then you get to listen as the other person does the same. When you say, “no, and here’s why” to someone, both of you are empowered. You empower yourself to take on only what you can actually do, and you empower the other person to deal with her own expectations and feelings in her own way. Fair or Equal? Which Way Is Best? Relationships are about fairness, not equality. Fair is getting your needs met and meeting another person’s needs as each situation arises. No keeping score; no equality; no horsetrading. Negotiation clarifies emotions and boundaries, but horsetrading sets up an unfair balance and leaves the relationship open to erosion or outright destruction. If you try to be equal all the time, often one or both people end up “wrong” instead. Yep, sometimes you get the big piece of pie, and sometimes you let the other person have it freely and with love. And sometimes you don’t want any pie at all. Stop trying to divide the pie into two equal pieces, because that’s not fair. All answers (yes, yes-but, and no-and-here’s-why) are fair, depending on the situation. So, let’s bring all this philosophical stuff down into the real world, where a team member might FEEL or KNOW that an upline leader has expectations and might resist. Let’s use as a hypothetical example that the downline person feels the upline person expects her to build a Young Living business, and the downline person has a whole bunch of very legitimate resistance to this expectation. Resistance is healthy, by the way, despite what the Borg said on Star Trek. Resistance (blocks, hesitation, confusion, resentment, frustration, overwhelm, whatever word you want to use) is healthy. Resistance is the strongest signal you’ll get from your emotions that something is wrong with boundaries—either your own boundaries or those of someone else. Something is wrong! Red alert! Shields up and load the forward torpedo bays! Aside: The usual pithy advice from network marketing teachers is to leave the resistant person by the side of the road and move on to the next person who is more willing to meet your expectations. Leaders, beware of this attitude! Obviously you can’t make anyone do what she doesn’t want to do, but make double-damn sure your expectations are in alignment with right action! OK, back to the person feeling the resistance. Spend some time with yourself and separate expectations you FEEL from ones you KNOW. Deal with the known ones first. Practice saying “yes” and feeling good about it. Practice saying “yes, but” and getting your own needs met fairly. Now, for the expectations you FEEL but don’t KNOW. Clarify if your feelings are real expectations from the other person. Be direct in your communication and conversation and ask, “Do you want/need/expect me to do [whatever]?” If the answer is yes, refer to the above section. If the answer is “no, I don’t expect that” or a confused look on the other person’s face, you have a priceless opportunity to explore your feelings of resistance. Using the above example, the downline person feels resistant to being expected to build a business. If the upline person is in alignment with right action, she would not assume/expect a commitment if one weren’t there, so the feelings reside with the resistant person. Excellent! Awesome! Super good news, because you can only be responsible for dealing with your own feelings and not those of others! Use this opportunity to explore the depths of your emotions, the darkest and brightest places of your past/current/future dreams, thoughts of failure and fear, thoughts of not-good-enough, thoughts of not-yet-until-such-and-such, thoughts of being too-little. While these places may seem dark, they are actually beautiful because they allow us to access the recesses of our selves. Ask yourself where you assumed an expectation, and why that might be important to resist, and when the feelings first came up, and what those feelings might mean to you going forward. I recommend applying juniper or frankincense essential oil when doing deep self-work, but that’s another story. All this brings your internal burdens up from subconscious to conscious light. Then, you get to choose (the magic word) whether you continue to carry burdens or set them down or give them back to the person they rightfully belong to. If you go deep enough and work long enough, eventually you will only carry your own expectations and release those of others. What a golden, blessed opportunity. Spend time with resistance and get to the bottom of it. Love that. What do you think? Are expectations healthy? Is feeling resistance healthy? How do you think the relationship might play out in this hypothetical example? Leave your thoughts in the comments. So, how do I at North Grove Marketing answer questions about the Young Living compensation plan? Compensation is top-of-mind to new distributors, and causes concern for everyone who’s building a Young Living distributorship. It’s somewhat complex. People have a lot of questions about it, and sometimes they ask me. I answer compensation level questions by referring everyone back to their upline person. I, Evelyn Fielding of North Grove Marketing, do not answer questions about how to make more money in a Young Living business. Whoa. Is that really what I just said? Yep. And here’s why. I believe (and this is my humble opinion; you may hold another opinion and be just as correct) that YLEO is not about making money. Hold on! Bear with me as I explain further. Of course you need money. But money itself isn’t a very good goal. Feeding the family, building your retirement savings, giving more back to your community, buying a new car are much better goals. Aiming at Silver In 6 is a really good goal. You have your personal goals, and money is a tool that helps you get there. When people ask me about the compensation plan, I ask them about their goals. The different levels of compensation have built-in benchmarks, of course, but I like to get more personal and really dive deep into what a person wants to do in business. So, if you have questions about what happens to your compensation when you reach the Gold level, I won’t answer them. Please go back to your upline person and sort it out, then come back to North Grove Marketing so we can keep you on the path toward reaching your goals. What is your personal goal, right now? Leave a comment so we can support you in reaching it!